In recent years, Vungle has become a big name in the world of in-app advertising. By implementing the Vungle SDK, app owners and companies are able to monetize their apps with video advertisements, turning their app into a business. For marketers, Vungle released Vungle Exchange, which streamlines the ad buying process by automatically connecting advertisers and publishers. Just this week, Vungle launched Vungle Premium, a private marketplace for brands to purchase video ad space in the world’s hottest apps. 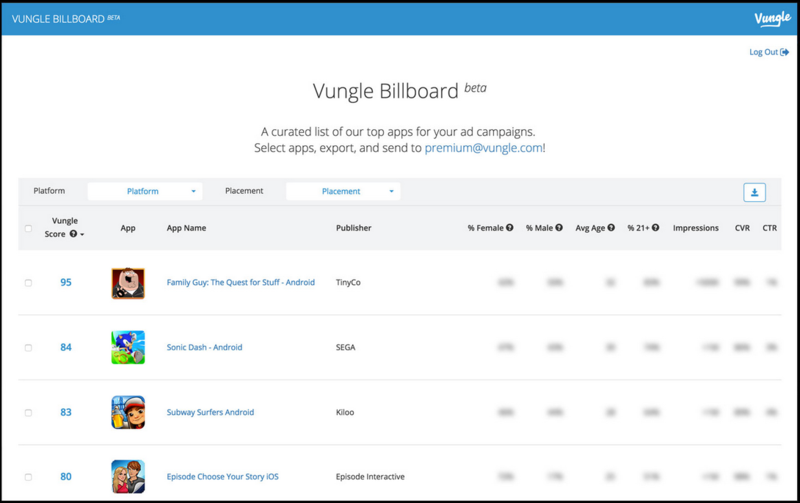 Given the constant fluctuation of app charts, Vungle Premium offers a private billboard (sort of like a Billboard Top 100) that scores apps based on desirability for advertisers. The Vungle score uses real-time metrics such as reach and conversion rates as well as the Nielsen Digital Ad Ratings to determine an apps place on the board. Marketers are then able to use these metrics to optimize their media purchases, personalize ad campaigns, and target on-brand audiences in the world’s most popular apps. This billboard allows advertisers to keep current with new and popular apps based on real-time trends and data. As the market for in-app video advertising continues to grow, advertisers will be able to leverage this billboard to expand brand campaigns to a larger and more relevant audience.